El campeón superpluma del Consejo Mundial de Boxeo, Miguel “Alacrán” Berchelt (31-1, 28 KOs) sabe que el ex campeón y su rival, el japonés Takashi Miura (31-3-2, 24 KOs), será una prueba difícil. El mexicano hará la primera defensa de su corona el 15 de julio en el Foro de Inglewood, California, contra el duro peleador japonés, quien es el clasificado número 1 de la división. “Hay varios campeones en la división… Lomachenko, Gervonta Davis, Jezreel Corrales, pero tengo que respetar a mi oponente, primero tengo que vencer a Miura y después venceré a los demás. Pienso que tengo la fuerza física y habilidad para poder derrotar a cualquiera en mi división. Es por eso que soy el campeón verde y oro, el de mayor prestigio”. Takashi perdió el título contra Francisco Vargas el 21 de noviembre de 2015 y Berchelt destronó a Vargas el 28 de enero de este año. 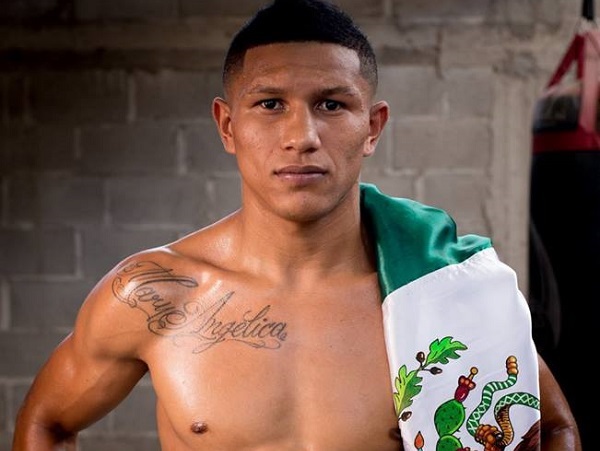 Aunque Berchelt es favorito para llevarse el triunfo, sabe que cualquier cosa podría suceder en el ring. A lot of thanks for every one of your efforts on this web site. My niece enjoys managing internet research and it is obvious why. I hear all of the powerful method you deliver valuable techniques by means of this blog and as well increase participation from other individuals on the content while our favorite simple princess is really understanding a great deal. Enjoy the remaining portion of the year. You’re doing a stunning job. Needed to write you this tiny note to be able to say thanks a lot as before regarding the fantastic techniques you have discussed on this website. It’s pretty open-handed with people like you to present freely all that a few people could have supplied as an electronic book to generate some dough on their own, specifically seeing that you could possibly have done it in case you decided. The solutions in addition served to provide a good way to be sure that other individuals have a similar dreams like my own to know the truth a little more on the topic of this problem. I am certain there are some more pleasurable moments up front for individuals who browse through your website. I in addition to my guys came looking at the great tips and hints found on your web page and immediately got an awful feeling I never thanked the site owner for those strategies. All of the boys ended up passionate to read them and already have absolutely been using those things. Thanks for simply being so accommodating as well as for going for this sort of cool subjects millions of individuals are really desirous to discover. My personal honest regret for not expressing appreciation to you earlier. I simply wanted to appreciate you yet again. I do not know the things that I would have worked on in the absence of the actual techniques revealed by you regarding this question. It seemed to be the daunting situation for me personally, but being able to view your specialized form you dealt with that forced me to jump for joy. I’m just happy for your work as well as have high hopes you find out what a powerful job that you are doing educating many people thru your webblog. More than likely you have never met any of us. I precisely needed to thank you so much once again. I do not know the things that I would’ve undertaken in the absence of the actual aspects provided by you regarding this area. It has been a real terrifying situation in my view, nevertheless encountering your specialised fashion you dealt with the issue forced me to cry with joy. I am grateful for this work as well as believe you find out what an amazing job you are always getting into educating people through your web blog. I’m certain you’ve never encountered all of us. My wife and i got very relieved that Raymond could deal with his survey via the ideas he received through the web site. It is now and again perplexing just to choose to be handing out hints which usually some others might have been selling. We keep in mind we have got the blog owner to give thanks to because of that. The main explanations you made, the simple site menu, the friendships you can aid to foster – it’s got everything amazing, and it’s making our son and us reckon that this concept is entertaining, and that’s rather fundamental. Many thanks for all the pieces! Thank you so much for giving everyone an extremely splendid opportunity to check tips from here. It is usually very enjoyable and as well , full of a good time for me and my office acquaintances to search the blog the equivalent of 3 times weekly to read the newest things you have. Not to mention, we’re at all times pleased with your stunning tactics served by you. Some 1 ideas in this post are in truth the simplest we have all had. I want to show appreciation to the writer just for rescuing me from this type of scenario. Right after searching through the internet and obtaining things which are not pleasant, I assumed my entire life was gone. Being alive devoid of the answers to the issues you’ve resolved through the write-up is a crucial case, and those that would have in a negative way damaged my entire career if I had not discovered your website. The ability and kindness in playing with a lot of stuff was valuable. I don’t know what I would have done if I had not encountered such a stuff like this. I can now look ahead to my future. Thanks very much for your skilled and effective guide. I won’t hesitate to propose the sites to anyone who requires support on this topic. I enjoy you because of every one of your hard work on this blog. My aunt take interest in setting aside time for internet research and it’s simple to grasp why. Almost all know all concerning the compelling medium you provide vital tips via the web site and as well as invigorate response from the others on the topic and my daughter is becoming educated so much. Have fun with the remaining portion of the year. You’re doing a superb job. I precisely wanted to say thanks all over again. I’m not certain the things that I would have tried without the type of information provided by you relating to that theme. Previously it was a very frightening issue in my view, but encountering a new professional style you solved that made me to leap with fulfillment. I am happier for the assistance and as well , expect you are aware of an amazing job you are always undertaking educating most people all through your websites. I am sure you haven’t met any of us. I precisely needed to say thanks once more. I’m not certain what I might have created without the entire ways provided by you regarding this situation. It became a frustrating matter in my view, however , being able to see the specialised approach you solved it made me to leap over contentment. Extremely thankful for this guidance as well as sincerely hope you comprehend what a great job that you are putting in teaching men and women thru a site. Most likely you haven’t encountered all of us. I have to express my appreciation for your kindness for those who actually need help with this important content. Your special dedication to getting the solution throughout came to be exceptionally practical and have frequently empowered somebody just like me to realize their ambitions. Your helpful guide entails much a person like me and substantially more to my fellow workers. Thank you; from all of us. I not to mention my guys were found to be reviewing the best procedures on your website then quickly I got a horrible suspicion I had not thanked the web site owner for those tips. All the guys are already for this reason very interested to read through them and already have undoubtedly been taking pleasure in them. Thanks for really being really considerate as well as for using this kind of very good information most people are really eager to understand about. My sincere regret for not expressing gratitude to you earlier. My spouse and i were so thrilled that Peter could round up his studies out of the precious recommendations he made using your web pages. It’s not at all simplistic to simply continually be giving freely points that many many others may have been trying to sell. And we figure out we have the website owner to thank because of that. The type of explanations you have made, the simple website navigation, the friendships you can make it easier to engender – it is all incredible, and it’s letting our son in addition to our family know that the subject matter is amusing, and that is highly pressing. Thank you for all the pieces!